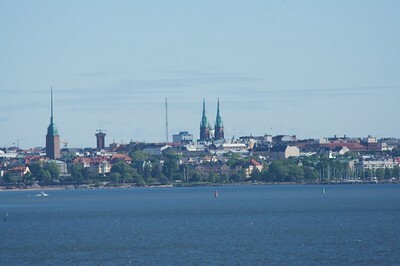 A view of the city as our ship sails into port. 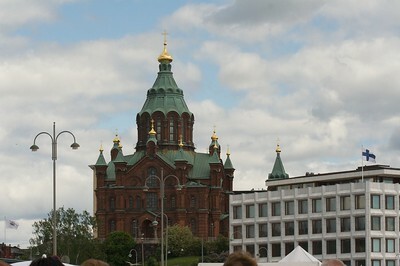 The twin towers in the center are part of St. John's Church (http://en.wikipedia.org/wiki/St._John%27s_Church,_Helsinki). 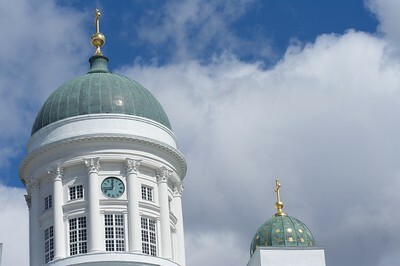 The single tower to the left is Agricola Church, the tallest church in Finland. 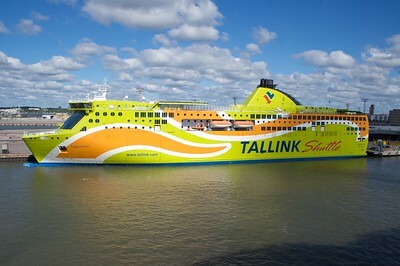 Showing up in almost every port, Tallink ships are one of the main ferry connections between cities on the Baltic Sea. This one was more colorful than most. Meaning Government Palace. 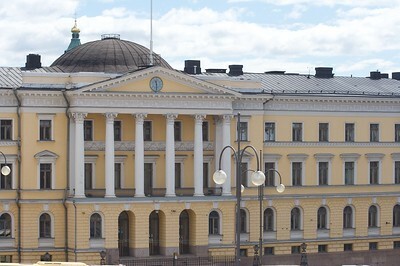 This impressive building houses the Finish Council of State, similar to the President's cabinet in the US, and consisting of the various Ministers who oversea different parts of the government. More American government buildings should be painted yellow. A beautiful Lutheran church near the market square area of the city. It was originally built as a tribute to Tsar Nicholas I of Russia. 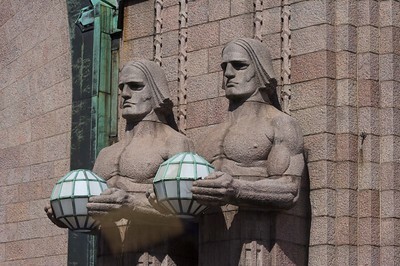 These two stone faces are from the front of the central railway station. For some reason they remind me of a set that Tim Burton might have used in his Batman movie. 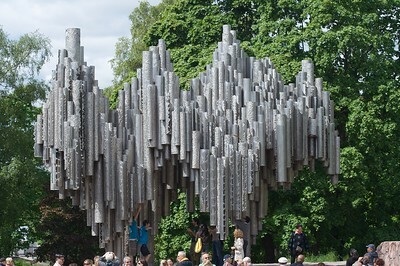 Located in a peaceful park in the northwest part of the city, this impressive sculpture honors Finland's national composer Jean Sibelius. As in the other cities we visited that were set among waterways, we saw lots of little restaurants accessible by boat. 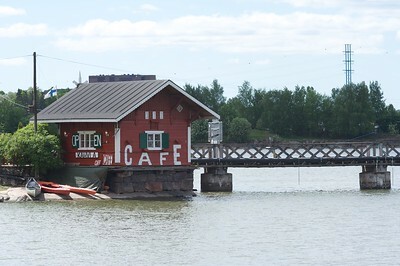 Kahvia means coffee in Finnish. 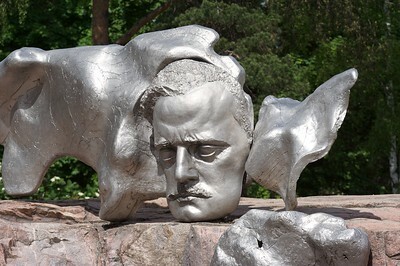 A metal sculpture of the composer sitting near his monument. He has a rather fierce visage. 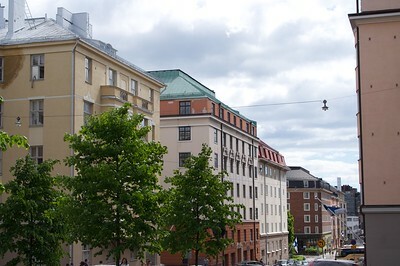 Looking down a street in the neighborhood near Temppeliaukio Kirkko, the Rock Church. 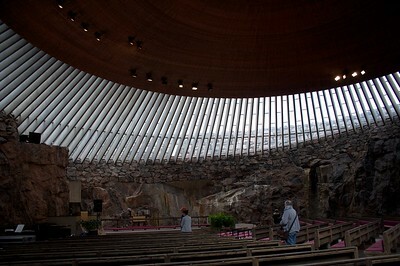 Also called the Rock Church because this Lutheran chuch was built into the native rock and topped with a copper dome. 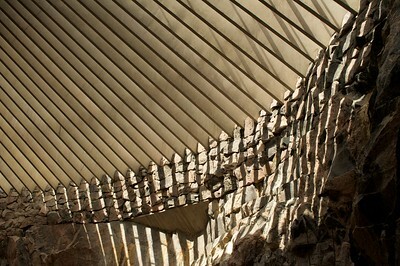 The light coming through the ceiling in the Rock Church produced some interesting patterns on the rock walls. 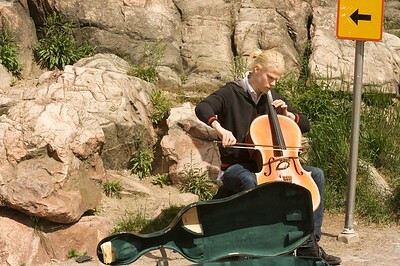 We saw street musicians in every city we visited but this was the only one playing a cello. He was in a beautiful setting outside the Rock Church. An Eastern Othodox cathedral located near the market square. 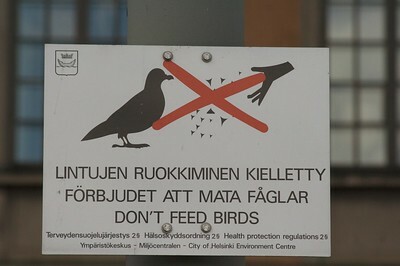 Both Finnish and Swedish are official languages of Finland so messages on signs like this are in both. Plus English for those of us who can't do either. 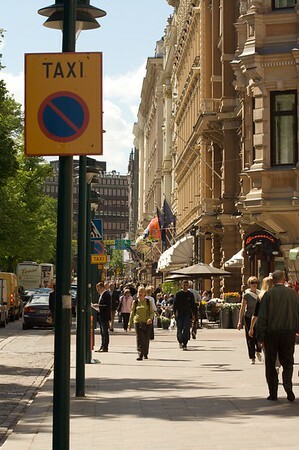 A busy street full of high end stores in the heart of Helsinki. 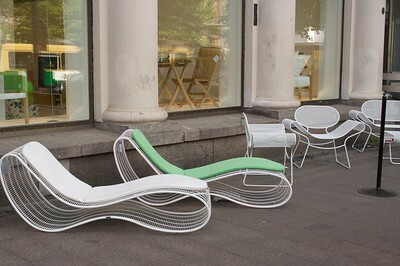 A display of patio furniture in front of a furniture store in downtown Helsinki.